Born in 1963, John Pickard is best known for a series of powerful orchestral and instrumental works and previous recordings on BIS of his music have received critical acclaim in reviews such as Gramophone('simply stunning'), American Record Guide('superb works in wonderful readings') and BBC Music Magazine('an absolute triumph). The present disc brings together some of Pickard's most recent orchestral compositions, in performances by two of his long-time collaborators: the BBC National Orchestra of Wales and conductor Martyn Brabbins. The opening work is Symphony No. 5, which was composed in 2014 with these performers in mind. Lasting some thirty minutes, the symphony is in a single continuous movement. It requires no less than three timpanists who are placed at the back of the orchestra to the right, left and centre, leading to some dramatic antiphonal exchanges. The symphony is followed by Sixteen Sunrises, the result of the composer's wish to compose a piece 'filled with light'. The title of the piece refers to the number of sunrises that can be observed during a twenty-four-hour period from the International Space Station (ISS), as it orbits the earth. 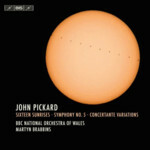 Musical depictions of sunrises are normally gradual processes, but viewed from the ISS, a sunrise occurs in a matter of seconds, and it is the idea of suddenly shifting from darkness to light (and back again) that formed the basis of the shape of Pickard's piece. In contrast to these two works, the Concertante Variations have been described by the composer as 'a light-hearted divertimento that poses no profound questions'. It is a concise concerto for wind quintet, strings and timpani, cast in the form of a theme and variations. The disc closes with Pickard's transcription of the well-known Toccata that Monteverdi used first in his opera Orfeo and later in the Vespers.